SAVE THE DATE for the 2019 Showpark Summer Festival $25,000 USHJA National Hunter Derby a benefit for Thrive Rescue. To be held on Friday, July 19 @ the Del Mar Horse Park Indoor Arena. Welcome to the 2019 World Championship Hunter Rider Series! Thank you to the exhibitors and managers who make this program so successful. All of the competitions listed below have been selected as 2019 WCHR Member Events and are eligible for inclusion in Regional and National point standings. For more information contact Danae Fryman at dfryman@ushja.org or (859) 225-6734. JOIN TODAY... and be part of the fun in 2019! Become a member by Midnight Eastern time of the last day of this competition and receive points toward Regional and National awards, and qualifying for the WCHR Finals Challenge classes held during the Capital Challenge Horse Show. For more information contact Danae Fryman at dfryman@ushja.org or (859) 225-6734, or visit www.ushja.org/wchr. 2019 Blenheim Summer Series – “A” Rated Hunter Class Specifications UNLESS OTHERWISE STATED: Refer to the Tentative Time Schedules for specific scheduling; All classes to be judged on performance and soundness; Three must compete in order for points to count for all USEF/PCHA rated classes; the Handy round is the last o/f class of each division; the first round of each Hunter Classic when held as part of the division is the second o/f class of each division; the Green Hunter Incentive Stake Class is the final round of each respective division; A minimum of two Over Fences and one Under Saddle Class must be held for a Division to be considered complete; Champion and Reserve Champion title will be awarded to two of the four horses acquiring the most points over fences in each applicable section; In addition to these points, only these four horses will receive full points for under saddle classes; Points to determine awards are as follows: 10, 6, 4, 2, 1, & ½; Model points to count ½; Prize Money to be distributed 30%-22%-15%-12%-11%-10%; Trophy & Ribbons 1 – 8 to be awarded. HIGH PERFORMANCE HUNTER presented by HE Tex Sutton Forwarding Co.
presented by Balmoral Farm, Inc.
2019 Blenheim Summer Series – “C” Rated Hunter Class Specifications UNLESS OTHERWISE STATED: Refer to the Tentative Time Schedules for specific scheduling; All classes to be judged on performance and soundness; Three must compete in order for points to count for all USEF/PCHA rated classes; First round of each Hunter Classic when held as part of the division is the second o/f class of each division; A minimum of two Over Fences and one Under Saddle Class must be held for a Division to be considered complete; Champion and Reserve Champion title will be awarded to two of the four horses acquiring the most points over fences in each applicable section; In addition to these points, only these four horses will receive full points for under saddle classes; Points to determine awards are as follows: 10, 6, 4, 2, 1, & ½. Trophy & Ribbons 1 – 8 to be awarded. Open to both juniors and amateurs who are current members of the USEF and USHJA - conducted under the same specifications as a Hunter Breeding Class. Judges are not required to ask competitors to show on the triangle; however, horses must be walked and trotted in hand. Conformation of the horse IS NOT to be considered. Horses or ponies may be of any age. Handlers will be judged on their ability to properly stand and present a horse in hand. Horses should be wellbehaved and should walk and trot promptly in hand. 2019 Blenheim Summer Series – Non-Rated Hunter Class Specifications UNLESS OTHERWISE STATED: Refer to the Tentative Time Schedules for specific scheduling; All classes to be judged on performance and soundness; Three must compete in order for points to count for all USEF/PCHA rated classes; two must compete in order for points to count for all non-rated classes. A minimum of two Over Fences and one Under Saddle Class must be held for a Division to be considered complete. Champion and Reserve Champion title will be awarded to two of the four horses acquiring the most points over fences in each applicable section. In addition to these points, only these four horses will receive full points for under saddle classes; Points to determine awards are as follows: 10, 6, 4, 2, 1, & ½; Model points to count ½; Trophy & Ribbons 1 – 8 to be awarded. MODIFIED CHILDREN’S HUNTER MODIFIED ADULT HUNTER Open to All Junior and Amateur Riders, however, Riders may only cross enter into Green Rider, Short/Long Stirrup & Low Child/Adult; Fence Height: 2’6”; Entry Fee: $225/division or $50/class *Divisions combine during BES June Classic I, II, III & Red, White & Blue – using class #s 630,631,632,634 & 635. CROSS RAIL OPPORTUNITY HUNTER Open to All Junior and Amateur Riders; however, Riders may not cross enter into any class exceeding 2’; Fence Height: 18”; Cantering is optional O/F; Entry Fee: $225/division or $50/class. 2019 Blenheim Summer Series – Hunter Classics & Hunter Derby Specifications UNLESS OTHERWISE STATED: Refer to the Tentative Time Schedules for specific scheduling; refer to individual organizations for specific league, specs, rules, etc; not all classics offered each week HUNTER CLASSIC ELIGIBILITY/ORDER OF GO: Horse/pony must have entered, shown and completed the course in at least two classes over fences in their respective division; AND MUST be declared by the closing of entries the day before competing in the first round; Horses/ponies declared after such time will be considered post entries and if space permits and if entry is accepted will automatically be placed first in the order of go; All posted orders will be drawn and posted by approximately 6:45AM the day of the Highlight Class/Classic, except where otherwise specified; $50 same day scratch fee applies. HUNTER CLASSIC FORMAT/SCORING: SECOND over fences class in each respective division is to count as the FIRST ROUND of respective Classic – also see (*) symbol in corresponding time schedules; Both rounds to be scored under the open numerical judging system; at least the top 12 if available or one-third of entries will return for the second round; if a horse or pony is eliminated in the first round of competition, they may not return for the second round. If a horse or pony does not return for the second round or is eliminated during the second round, a score of zero will be combined with the first-round score and the horse/rider combination will be placed accordingly. Scores will be totaled from both rounds to determine the winners. All overall ties to be broken by using second round score. All Classics to award points towards USEF HOTY awards but not towards Show Champion; HUNTER CLASSIC & DERBY ATTIRE/AWARDS: Formal Attire Required; Trophy to first, Ribbons thru 12th place; Unless otherwise stated, prize money divided as follows: 30%, 22%, 15%, 10%, 7%, 6%, 5%, 5%; If an awards ceremony is conducted, all ribbon winners required to attend and participate; The winner will be required to be present to receive award. ADDITIONAL NON-RATED HUNTER CLASSICS – Held during Blenheim Red, White, & Blue Classic only – not to count toward USEF Zone or National HOTY awards. Ribbons 1 – 12 & Trophy 800 - $1500 3’ Open Hunter Classic – Two round Classic; Top 12 return for 2nd round based on scores from 1st round; Entry Fee: $150; Nom Fee: $50 850 – 2’9” Low Child/Adult Hunter Classic - Two Round Classic – Round One designated class within the Low Child/Adult Hunter division; Top 12 return for Round Two based on scores from Round One. Entry Fee: $25; Nom Fee: $25 851 – 2’6” Modified Child/Adult Hunter Classic – Two Round Classic – Round One designated class within the Modified Child/Adult Hunter division; Top 12 return for Round Two based on scores from Round One. Entry Fee: $25; Nom Fee: $25 852 – 2’ Short/Long Stirrup Hunter Classic - Two Round Classic – Round One designated class within the Short/Long Stirrup Hunter division; Top 12 return for Round Two based on scores from Round One. Entry Fee: $25; Nom Fee: $25 956 – 3’ A/O Hunter Classic – to be held during Showpark Summer Festival only as part of new BES West Coast A/O Hunter Challenge. Two round Classic; Top 12 return for the second round based on scores from Round One. USHJA WCHR HUNTER SPECTACULAR, WEST COAST – see ushja.org for specifications 802 - $25,000 USHJA/WCHR HUNTER SPECTACULAR WEST COAST – to be held during Blenheim June Classic I, Entry Fee: $600; Fences 3’6”, 3’9”, 4’; Entries Close June 8 @ 3pm; Official Class Specs at USHJA.org; Mandatory Horse Jog & Rider’s Meeting prior to commencement of Class – See USHJA Tent ringside at the Pacific Field for Nomination Forms, Timelines & Rider Packets 800 – USHJA/WCHR HUNTER SPECTACULAR WARM UP – Open to horse entered in class #802 – Entry Fee: $75; Fences: 3'6"; Class will not be judged, but riders must jump posted course and will be eliminated after three refusals. WCHR – JUNE CLASSIC 1 SPECIAL AWARDS, PRESENTED BY USHJA Leading Hunter Rider Award: A plaque will be awarded to the rider who achieves the single highest numerical score in any one class within any WCHR hunter section during WCHR Spectacular week. * High Score Awards: A jacket will be awarded to the riders who achieve the single highest numerical score in any one class, within their respective hunter section, in each of the nine WCHR categories: Professional, Developing Professional, Amateur Owner 3’6”, Amateur Owner 3’3”, Adult Amateur, Junior 3’6”, Junior 3’3”, Children’s and Pony. * * Should a tie occur between two or more riders for high score within a category or for the Leading Hunter Rider, the rider with the highest cumulative over fences in that category will be awarded the WCHR high score award and WCHR Leading Hunter Rider award. Riders must be 2019 WCHR members to be eligible for a high score award and are only eligible for an award in their declared category. 800 – $10,000 USHJA INTERNATIONAL HUNTER DERBY – to be held Blenheim June Classic II as a one star; Entry Fee: $400; Additional Show Awards presented including: Makoto Farm Best Turned Out Horse Groom’s Award; barnstyle High Score Junior & The Plaid Horse High Score Amateur Awards; Balmoral Farm Winning Owner Award 802 – HUNTER DERBY WARM UP - Open to horses entered in Class 800 – USHJA Intl. Hunter Derby. Entry Fee: $75; Fences: 3'6"; Class will not be judged, but riders must jump posted course and will be eliminated after three refusals. 851 - $1500 USHJA PONY HUNTER DERBY, presented by Markel Insurance – to be held Blenheim June Classic II & III; Entry Fee: $150; Additional Awards presented including: Makoto Farm Best Turned out Pony Groom’s Award, Makoto Farm High Score S, M, L Pony; Balmoral Farm Winning Owner Award; Qualifier for the inaugural 2019 USHJA Pony Hunter Derby Championships, West Coast – to be held during Blenheim Fall Tournament, September 11 – 15, 2019. Qualifying for the Championships ends July 15, 2019, for the West Coast Learn more at ushja.org/PonyHunterDerby. A $50 SmartPak Gift Certificate will be awarded to the Horse who has accumulated the most points in the following Divisions: • Conformation Hunter – Green & High • 3'3" Amateur Owner Hunter (model points not to count) • 3'6" Amateur Owner Hunter • Performance Hunter – 3'3", 3'6", & High • Adult Amateur Hunter • Green Hunter – 3', 3'3", 3'6", 3'9" • Pony Hunter • 3'3" Junior Hunter • Children’s Pony Hunter • 3'6" Junior Hunter • Overall Award – Highest Total points • Children’s Hunter from all sections TIES – High Score ties to be broken by using the Handy Hunter Score; if Handy Hunter Round does not apply then awards to remain tied; Grand Champion ties to be broken by the total number of over fences points, if points are equal then awards to remain tied; Model Points not to count. CHIP IN FOR CHARITY Blenheim EquiSports is proud to continue the Chip in for Charity program, where class winners who receive a "charity chip" have the choice of redeeming a first place prize OR donating the $5 value to any one of the six chosen charities: Red Bucket Equine Rescue, San Juan Capistrano Equestrian Coalition, Park Place Foundation, Thrive Animal Rescue, the CPHA Foundation, and the USET Foundation. And the Wasserman Foundation is generously offering to match all donations made this year! More details on the program can be found at showpark.com and in the Horse Show Office. 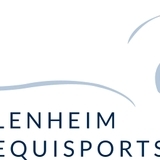 2019 Blenheim Summer Series, FEI 2* Specs - Showpark Racing Festival Entries must be made by the Athlete’s Federation through the FEI Entry System. In addition, entries for the FEI Division must be on the FEI Entry Blank. Please refer to the official FEI Definite Schedule for fees, rules and regulations regarding the FEI Division. FEI DIVISION ENTRY FEE (Maximum THREE horses per rider) 1st Horse – 1650 USD, 2nd Horse – 900 USD, 3rd Horse – 300 USD (Total $2850 USD for 3 horses) and includes start fees, horse stall, drug administration, & association fees; hay and shavings are not included; FEI Tack stalls are available for $275 each; Each FEI rider to receive one VIP/Medal Club Pass for the week, commencing Wednesday, July 24, 8:00am through end of day, Sunday, July 28, 2018. All horses entered in Competitions 821, 822 and 823 must be stabled in secure stabling and must be present for Veterinary Inspections Tuesday, July 23, 2019 @ 2pm; Stabling opens Monday, July 22 @ noon; Each rider will receive 5 credentials for access to the secured stabling area. 2019 Blenheim Summer Series, FEI 2* Specs - Showpark August Festival Entries must be made by the Athlete’s Federation through the FEI Entry System. In addition, entries for the FEI Division must be on the FEI Entry Blank. Please refer to the official FEI Definite Schedule for fees, rules and regulations regarding the FEI Division. FEI DIVISION ENTRY FEE (Maximum THREE horses per rider): 1st Horse – 1650 USD, 2nd Horse – 900 USD, 3rd Horse – 300 USD (Total $2850 USD for 3 horses) and includes start fees, horse stall, drug administration, & association fees; hay and shavings are not included; FEI Tack stalls are available for $275 each; Each FEI rider to receive one VIP/Medal Club Pass for the week, commencing Wednesday, July 31, 8:00am through end of day, Sunday, August 5, 2019. All horses entered in Competitions 821, 823 and 823 must be stabled in secure stabling and must be present for Veterinary Inspections Tuesday, July 30, 2019 @ 2:00pm; Stabling opens Monday, July 29 @ noon; Each rider will receive 5 credentials for access to the secured stabling area. FEI CSI 2* COMPETITIONS – Showpark August Festival GOLD TOUR CLASS #821 – $1,500 CSI 2* 1.40m GOLD TOUR POWER & SPEED: Wednesday, July 31, 2019 – Competition in Two Phases, Article 274.5.2; Riders may have up to two horses. Prize money will be distributed as listed in the FEI Schedule. CLASS #822 – $35,000 CSI 2* 1.45m GOLD TOUR SPEED STAKE: Thursday, August 1, 2019 Competition against the clock, Article 238.2.1; Qualifier for the Grand Prix, #823; Riders may have up to two horses; Qualifier for the Grand Prix, Class #823; Prize money will be distributed as listed in the FEI Schedule. This competition counts for the Longines Ranking Group D & is a Rolex/USEF Certified Grand Prix, #19171. CLASS #823 – $35,500 CSI 2* 1.45m GOLD TOUR GRAND PRIX: Saturday, August 3, 2019 Competition against the clock with jump-off, Article 238.2.2 - In the event of equality of penalties for first place, there will be one jump-off against the clock; Riders may have one horse (two if less than 30 declared starters). Prize money will be distributed as listed in the FEI Schedule. This competition counts for the Longines Ranking Group C & is a Rolex/USEF Certified Grand Prix, #19171. Join the Blenheim EquiSports 2019 VIP Medal Club The Blenheim EquiSports VIP Medal Club is the ideal place to spend time off the horse. From hot coffee and a continental breakfast spread in the morning to a catered lunch each day of the horse show week, dining tables as well as comfy couches await competitors, trainers, owners, family and friends. Medal Club Members can watch the horse show action in three grass fields. An unmatched west coast horse show amenity, Members can also watch TV, go online, read magazines or simply relax. Privileges are offered at all Blenheim horse shows and selected Showpark horse shows during the 2019 season. Pricing above reflects a cash, check, or money order payment discount - credit cards are accepted, with an additional 3% fee. 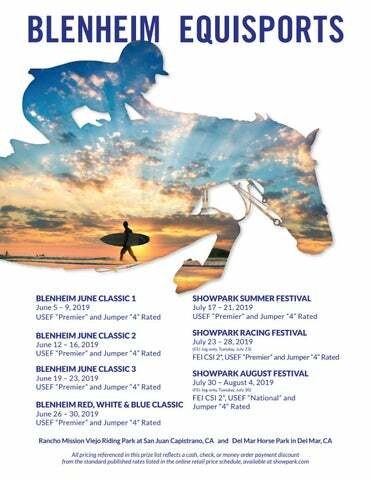 2019 Blenheim Summer Series – USEF Jumper Class Specifications UNLESS OTHERWISE STATED: Refer to the Tentative Time Schedules for scheduling & tables; Management reserves the right to change tables in all jumper classes with adequate notice to exhibitors. JUMPER NOMINATING & HORSE RECORDING: Horses entered in any classes offered at 1.30m or above that pay prize money must pay a $75 nominating fee; All horses must be recorded with the USHJA and any change of a recorded horse’s name and/or ownership MUST be recorded with the USEF in accordance with JP 100. Young Jumpers, if only showing in age restricted classes, plus one additional non-prize money class, are exempt from all Nominating Fees; ELIGIBILITY: To be eligible to compete, all entries must be properly registered and recorded with the Show Office and unless otherwise stated, all competition declarations must be made by 5:00pm (or ½ hour after the last class, whichever occurs first) the day prior to each competition. COMPETITION JUMPING ORDERS: Competitions in the Jumper Rings will be assigned by Management a specific start and end time; competitions held at the same height and listed together on the time schedule will be run concurrently. Per JP 112, Management will institute a Posted Order to determine the Start Order for all Grand Prix and competitions held in the Grand Prix Ring, all competitions $5000 or greater, plus the highest placing money class per section; Management may also institute a Posted Order to determine the Start Order for all other jumping competitions. Failure to enter the ring within one minute after an audible signal to proceed is given incurs elimination. If a Management determined Posted Order is not implemented all jumping orders will be conducted using the Exhibitor Sign Up method which allows all entries properly entered the option to sign up for a competition time slot/jumping position via online from 6:00pm - 5:00am prior thru Showpark.com and the Blenheim App OR in person using the official signup sheets at the tent by the main food stand from 6:30am - 7:30am prior. Entries failing to make their scheduled time slot/jumping position within one minute of their scheduled start time may be allowed to compete at the discretion of the Paddock Steward if a time slot becomes available and only if the entry competes prior to the proposed competition end time. Entries failing to sign up for time slot/start position will not be allowed to compete unless authorization is granted by the Technical Coordinator or Show Management. Riders and trainers who have conflicts due to jumping positions commencing at the same time in multiple rings are required to consult the Paddock Steward or Technical Coordinator prior to the start time of the competition(s) in question so that necessary adjustments can be made in the jumping order to accommodate said conflicts. TACK (Per JP 111): Martingales – When used in a conventional manner, No restrictions for classes offered at 1.30m or below; only running martingales permitted for all classes above 1.30m and ALL YOUNG HORSE CLASSES. Draw Reins/German Martingales – May only be used when schooling or in classes with no prize money that are offered at 1.20m or below. Ponies may not be ridden by a Junior rider in draw reins or German martingales at any time. No other head set devices (chambon, etc.) are permitted in any class, Exception: Irish martingales are permitted in all classes; Boots – Young Jumpers – see JP116; All others: The total maximum weight of equipment allowed to be added to a Horse’s leg, front or hind (single or multiple boots, fetlock rings, etc), is 500 grams or 17.637 ounces (shoe excluded). Failure to comply will incur disqualification. ATTIRE (Per JP 111): ALL Grand Prix, Classics, and Young Jumper Classics/Qualifiers: “Formal”; Grand Prix Ring: “Proper” for all classes unless otherwise stated: Riding jackets of any color required; Light colored breeches required; Shirts, light in color, must be tucked in and fastened at the top of the neck; Ties or chokers of any color must be worn (unless the shirt, by design, has the choker built in for its intended use); Boots required, half chaps with matching paddock boots permitted. All Other Jumper Rings: “Standard” for all classes unless otherwise stated: Riding jackets are NOT required; Breeches required, any color allowed; Shirts must be SOLID in color, tucked in, and must have a collar and sleeves. IN CASE OF INCLEMENT or EXTREME WEATHER, jackets (other than riding) or sweaters must be SOLID in color and are ONLY ALLOWED TO BE WORN if permission is given by the JUDGE(s) and/or MANAGEMENT and MUST be asked ahead of time. TIED STIRRUPS are PROHIBITED. All entries must use the official competition number assigned and issued by the Show Office; substitute competition numbers issued by none other than the Show Office may be considered in-valid and may result in a score of elimination; All entries competing without a competition number will receive a score of elimination. COURSES: Time allowed calculated using 350m/minute (325m/minute for Pony, Children’s, & A/A) otherwise indicated on course map. JUMPER SCHOOLING: Jumper schooling must be conducted in designated schooling areas only. Schooling inside the jumper competition arenas is prohibited at all times. No poling or offsets allowed; safety cups must be used in the proper manner; All jumps must be properly flagged. Violations of schooling regulations may be considered cause for FINES and/or ELIMINATION and can be instituted by the official schooling supervisor, Paddock Steward, official USEF Steward or any member of management should the situation arise. NATURAL OBSTACLE SCHOOLING: Available during the Blenheim Summer Classic II & III Horse Show on the Blenheim Derby Field for $75/round. Entries will be given four minutes to school the grob, water jump and bank. Entries will be eliminated after four refusals. No outside assistance will be allowed inside the arena. See specifications in the horse show office for more details. Sign up using the Official Entry Form – Class 700. AWARDS/PRIZE MONEY/CHAMPIONS & RESERVE CHAMPION (Per JP 108 & 110): Unless otherwise stated, three must compete in order for points to count for all USEF/PCHA recognized classes; two must compete in order for points to count for all non-recognized classes. All Classes offering more than $500 in prize money to award one ribbon/placing for every FOUR starters with a minimum of 8 ribbons to be awarded; last place to be awarded a minimum of the class start fee. All other classes to award 8 ribbons unless otherwise stated. Champion and Reserve Champion title will be awarded to the two horses which have acquired the most points in the .65m/.70m, .80m, .90m, 1.00m, 1.10m, 1.15m, 1.20m, 1.25m, 1.30m, 1.35m, 1.40m, Low Children’s, Low Adult Amateur; Children’s, Adult Amateur, 1.20m JR/AO/AM, 1.30m JR/AO, and 1.40m JR/AO Jumper Divisions. Awards are determined using 10, 6, 4, 2, 1, ½ for all classes per division, including corresponding Classics. Should there be a tie for any one award the placing in the corresponding Classic will break all ties. To be considered for an award, all divisions must hold a minimum of three classes per division, not including the corresponding classic. If a division should hold more than three classes, all classes to count towards the show championship. Prize Money awarded in each jumper section will count towards respective USEF Horse of the Year Awards. Join the NAL before competing in NAL classes at any horse show to ensure your eligibility to receive valuable points. The NAL hosts classes at more than 600 horse shows across the US and Canada. $500 - $10,000 JUMPER CLASSICS 386 -- .90m MODIFIED CHILD/ADULT JUMPER CLASSIC, Entry Fee: $40 380 – 1.0m Veredus LOW CHILDREN’S/ADULT JUMPER CLASSIC, Entry Fee: $40; Prize Money: $500 385 – 1.05m PONY JUMPER CLASSIC, Entry Fee: $40 359 – 1.10m JUMPER CLASSIC, Entry Fee: $80; Prize Money: $1000 356 – 1.20m Mary’s Tack & Feed JUMPER CLASSIC, Entry Fee: $160; Prize Money: $2000 353 – 1.15m One K Helmets CHILDREN’S JUMPER CLASSIC, Entry Fee: $80; Prize Money: $1000 ^ 358 – 1.15m Romfh Equestrian Apparel ADULT AMATEUR JUMPER CLASSIC, Entry Fee: $80; Prize Money: $1000 ^ 355 – 1.35m Valencia Sport Saddlery JR/AO/AMATEUR JUMPER CLASSIC, Entry Fee: $160; Prize Money: $2000 ^ ^ - Qualifiers for the NAL Children’s, Adult Amateur, and Junior/Amateur Jumper Finals – West Coast Final to be held during Blenheim International Jumping Festival, September 18 – 22, 2019 371 – 1.25m Antares Sellier JR/AO/AMATEUR JUMPER CLASSIC, Entry Fee: $120; Prize Money: $1500 352 – 1.30m Antares Sellier JUMPER CLASSIC, Entry Fee: $250, Prize Money: $5000 352 – 1.35m Antares Sellier JUMPER CLASSIC, Entry Fee: $250, Prize Money: $5000 352 – 1.35m Antares Sellier JUMPER CLASSIC, Entry Fee: $350, Prize Money: $10,000 352 – 1.40m Antares Sellier JUMPER CLASSIC, Entry Fee: $250, Prize Money: $5,000 356 – 1.35m BES Developmental Jumper Series JUMPER CLASSIC, Entry Fee: $200; Prize Money: $5000 – open to horses who have not yet competed in more than two National Grand Prix or higher in the current show season; Click HERE for specs; Qualifier for the BES Developmental Jumper Series Final to be held during Showpark All Seasons, Aug 28 – Sep 1, 2019 307 – 1.40m OPEN JUMPER CLASSIC, Entry Fee: $250; Prize Money: $5000 350 – 1.45m Kastel Denmark JR/AO/AMATEUR JUMPER CLASSIC, Entry Fee: $250; Prize Money: $5000 +Qualifiers for the Hollowbrook Wealth Management / Show Jumping Hall of Fame JR/AO Jumper Finals – West Coast Final to be held during Blenheim International Jumping Festival, September 18 – 22, 2019 309 – 1.45m BES U25 JUMPER CLASSIC, Entry Fee: $150; Prize Money: $2500 - to be run in conjunction with select Markel Grand Prix events - Click HERE for Program Info/spec, etc 999 – INDEPENDENCE DAY PAIRS RELAY COSTUME CLASS (to be held during Blenheim Red, White & Blue Classic only) ENTRY FEE: $50 per team; FORMAT: One Round Timed Pairs Competition – Fastest Time wins; 14 total fences - Fences 1 – 7 set at 1.10m; Fences 8 – 14 set at 1.10m; Time commences once Rider 1 crosses start line and concludes once Rider 2 crosses finish line. Rider One jumps fences 1 – 7; upon landing from Fence 7, Rider Two jumps fences 8 – 14. Scoring: Rail = 4 seconds added; 1st Refusal = time taken; 2nd Refusal (in the same phase) = Elimination; Rider Two jumping Fence 8 before Rider 1 lands from Jumping Fence 7 = 5 seconds added; Off Course = Elimination; Fall of Horse/Rider = Elimination. Ribbons 1 – 8; Trophy to winning Team; Prizes to Best Team Costume. USEF SAFE SPORT TRAINING REQUIREMENT Starting January 1, 2019, if you are a USEF Competing Member 18 years of age or older you are required to complete the core Safe Sport Training within 30 days of activating your membership. If you do not complete the training, you are ineligible to participate in all USEF activities including competitions. TAKE the SAFE SPORT TRAINING at USEF.org by logging into your member dashboard. Rules & General Information EVERY CLASS OFFERED HEREIN WHICH IS COVERED BY THE RULES AND SPECIFICATIONS OF THE CURRENT US EQUESTRIAN FEDERATION RULE BOOK WILL BE CONDUCTED AND JUDGED IN ACCORDANCE THEREWITH USEF Membership Statement: The 2019 Blenheim June Classic I, II, III & Red, White, & Blue Horse Shows and the Showpark Racing, Summer, and August Festival Horse Shows are covered by the rules and specifications of the current USEF Rule Book (GR901.9) and will be conducted and judged in accordance therewith. Life, senior active and junior active members shall be eligible to participate in all classes at Regular Competitions, Eventing Competitions at the Preliminary Level or above and Combined Driving Competitions at the Advanced Level, Dressage, Reining and Vaulting Competitions and Endurance Rides. A non-member may participate as a handler, rider, driver, owner, lessee, agent, coach or trainer at Regular Competitions, Eventing Competitions, Dressage Competitions, Reining Competitions and Combined Driving Competitions upon payment of a $45 Show Pass fee. Participants in the following classes are exempted from the Requirements of this rule: 1) leadline; 2) exhibitions; 3) games and races; 4) classes for 4-H members; 5) walk trot (exception: Friesian performance FR218) and academy classes (academy classes are classes limited to horses used regularly in a lesson program); 6) USDF introductory level tests, pas de deux and quadrille classes; 7) NRHA Endorsed Reining Competitions. 8) Opportunity classes, 9) citizens of other nations who have proof, in English, of current membership in good standing of their own National Federation, 10) USEA beginner novice division; and 11) assistant handlers in Dressage Sport Horse Breeding classes. Federation Entry Agreement: Per USEF GR 908: By entering a Federation-licensed Competition and signing this entry blank as the Owner, Lessee, Trainer, Manager, Agent, Coach, Driver, Rider, Handler, Vaulter or Longeur and on behalf of myself and my principals, representatives, employees and agents, I agree that I am subject to the Bylaws and Rules of The United States Equestrian Federation, Inc. (the “Federation”) and the local rules of The Blenheim Summer Classics I, II & III and Red, White, & Blue Classic; and Showpark Summer, Racing, and August Festival (the “Competition”). I AGREE in consideration for my participation in this Competition to the following: I AGREE that “the Federation” and “Competition” as used herein includes the Licensee and Competition Management, as well as all of their officials, officers, directors, employees, agents, personnel, volunteers and Federation affiliates. I AGREE that I choose to participate voluntarily in the Competition with my horse, as a rider, driver, handler, vaulter, longeur, lessee, owner, agent, coach, trainer, or as parent or guardian of a junior exhibitor. I am fully aware and acknowledge that horse sports and the Competition involve inherent dangerous risks of accident, loss, and serious bodily injury including broken bones, head injuries, trauma, pain, suffering, or death (“Harm”). I AGREE to hold harmless and release the Federation and the Competition from all claims for money damages or otherwise for any Harm to me or my horse and for any Harm of any nature caused by me or my horse to others, even if the Harm arises or results, directly or indirectly, from the negligence of the Federation or the Competition. I AGREE to expressly assume all risks of Harm to me or my horse, including Harm resulting from the negligence of the Federation or the Competition. I AGREE to indemnify (that is, to pay any losses, damages, or costs incurred by) the Federation and the Competition and to hold them harmless with respect to claims for Harm to me or my horse, and for claims made by others for any Harm caused by me or my horse while at the Competition. I have read the Federation Rules about protective equipment, including GR801 and, if applicable, EV114, and I understand that I am entitled to wear protective equipment without penalty, and I acknowledge that the Federation strongly encourages me to do so while WARNING that no protective equipment can guard against all injuries. If I am a parent or guardian of a junior exhibitor, I consent to the child’s participation and AGREE to all of the above provisions and AGREE to assume all of the obligations of this Release on the child’s behalf. I represent that I have the requisite training, coaching and abilities to safely compete in this competition. I AGREE that if I am injured at this competition, the medical personnel treating my injuries may provide information on my injury and treatment to the Federation on the official USEF accident/injury report form. BY SIGNING BELOW, I AGREE to be bound by all applicable Federation Rules and all terms and provisions of this entry blank and all terms and provisions of this Prize List. If I am signing and submitting this Agreement electronically, I acknowledge that my electronic signature shall have the same validity, force and effect as if I affixed my signature by my own hand. 1. ENTRY PROCEDURE: Entry to the competition & Stall Reservations are due by 5:00pm on the Closing Day of each published competition and MUST include the following to be considered “on time” & “received”: • stall payment; • ALL horse, rider, trainer, and owner information, including a valid social security number assigned to the payee for all prize money collected; • signatures by all responsible parties. • All entry and stall reservations are accepted via mail or via fax and must include both sides of the entry blank; entry blanks displaying only the front page will not be accepted. • Upon arrival at the competition, in order to compete, all competitors or their agents must obtain the official show number at the show office; show numbers will not be issued until all information required is obtained and a signed open check or valid credit card is on file with the show office. Payment procedure as follows: • Credit Cards – All Credit Card transactions will be processed according to the standard published rates listed in the Retail Price List - available by request or online at showpark.com. Those rates do not reflect the 3% discount received if paying by cash, check or money order. If paying by credit card, upon receipt of the entry blank, Horse Show Management will charge the credit card for the Competition deposit fees and stall fees. Credit cards shall be presented to Horse Show Management in the office before or at the time of close out. If such card is not presented or an alternative method of payment is not made, Rider/Trainer/Owner agrees that Horse Show Management is authorized to charge the credit card pursuant to the information contained in the entry blank at the conclusion of the Competition. • Cash, Check, Money Order Payments – The rates in this Prize List reflect the 3% discount received if paying by cash, check or money order. If paying by check, cash, or money order please submit the required payment, made payable to BES, with a complete entry blank for each showing or non-showing entry, on or by the published Closing Dates for each respective show to the following address for processing: 7668 El Camino Real, Suite 104–#501, Carlsbad, CA 92009. • Closing Date of Entries & Stall Reservations: Blenheim June Classic I – May 13, Blenheim June Classic II – May 20, Blenheim June Classic III – May 27; Blenheim Red, White, & Blue Classic – June 3, Showpark Racing Festival – June 24, Showpark Summer Festival – July 1, Showpark August Festival – July 8 2. ADDITIONAL NON-USEF/USHJA REQUIRED PER COMPETITION FEES: • Late Entry Fees: If space permits, once accepted, all post-entries will be accessed a late entry fee of $50/competition. A post entry is an entry received after the closing date/competition through 5:00pm the Sunday prior to the competition week in question. • Same Competition Late Entry Fees: If space permits, once accepted, all same competition post entries will be accessed a late entry fee of $75. A same competition late entry is an entry received the Monday or Tuesday prior to and during the competition week in consideration. • Nomination/Per Horse Entry Fee: All entries must pay a $50 Nomination/Horse Fee per competition. Young Hunters & Young Jumper entries are exempt from this fee and may also compete in the official Young Hunter Warm Up and one other non-prize money jumper class courtesy of Management at no additional class or Horse Nomination Fee. • All entries competing in Jumper Classes held at 1.30m or above must pay an additional $75 Jumper Nomination Fee/competition. • All entries must pay a Facility Fee of $75/competition. • A one-time Grounds Fee of $55/competition will be assessed to all entries who compete without reserving a stall. • A Haul-In Fee of $55/day/competition will be assessed to all entries who compete without reserving a stall and who trailer-in to compete. • Stall Door Removal - $100/stall/competition • Illegal Dumping - $100/infraction 3. COMPETITION NUMBERS: All entries must use the official competition number assigned and issued by the Show Office; substitute competition numbers issued by none other than the Show Office may be considered in-valid and may result in a score of elimination. All entries competing without a competition number will receive a score of elimination. 4. POST ENTRIES/ADDS & SCRATCHES: All declarations, adds and/or scratches to the competition entry must be done by 5:00pm (or ½ hour after the last class, whichever occurs first) the day prior to the competition in question. See Hunter & Jumper Class & Classic Specifications for further eligibility information. See Rules #1 & #2 for fee information. Entries found competing in competitions/classes without being properly entered will be charged a $15 penalty plus twice the regular entry fee/infraction; Classics scratched on the same day will be assessed a $50 fee. 5. REFUNDS: On or before the closing day of entries, full refunds will be given. After the closing day of entries, STALL FEES WILL NOT BE REFUNDED. After the competition starts, with the official show vet’s certificate only, entry refunds will be given, minus a $50 scratch fee and fees for competitions held prior to notification at the Show Office, where exhibited or not. For competing entries there is no fee to scratch a competition/class as long as notification has been made in the show office prior to the start of the scratched competition/class. Should management have to cancel competitions/classes/divisions that cannot be rescheduled due to inclement weather and/or any other emergency or unforeseen situation there are no refunds on entry & stall fees & of any other fees of any kind. 6. ADD BACKS: In classes with add backs, prize money is computed from the number of horses that actually show. 7. PRIZE MONEY: Prize money will pay thru 5th place – 30%, 25%, 20%, 15%, 10%. Grand Prix, Feature Competitions, & Classics – see Class specifications. Prize money checks will be made payable to the owner listed on the entry blank and will be mailed within 30 days of the conclusion of the show. NO PRIZE MONEY WILL BE MAILED UNLESS THE PAYEE'S SOCIAL SECURITY NUMBER AND COMPLETE ADDRESS IS LISTED ON THE ENTRY BLANK. Prize money won by foreign competitors: Be advised that the U.S. Internal Revenue Service requires sporting events to withhold 30% of prize money won in the United States. Foreign competitors should apply for a U.S. Social Security number and will be asked to complete form 8283 or complete a W-8 Certificate of Foreign Status form. 8. MANAGEMENT: The Horse Show Management reserves the right to itself to interpret all questions and conditions in regard to or arising out of or incident to the show without claims for damages or recourse of any kind. All questions not covered in these rules and regulations shall be decided by the Horse Show Management and their decision is final. The Horse Show Management reserves to itself the right to refuse, accept conditionally, or to cancel any entries, disqualify riders or exhibitors, prohibit claim damages; to change any course, to cancel or combine any unfilled classes, or to reschedule classes, after due notice to exhibitors; to change rings or rotate judges, and to change specifications in jumper classes 9. CONDITION OF ENTRY: Every horse entered for competition will be under the control of Horse Show Management but the Horse Show Management will, in no case, be responsible for any loss or damage that may occur, and it shall be a condition of entry that each exhibitor shall hold the Horse Show (competition) and its officials, employees, directors, officers, Blenheim EquiSports Management Company, LLC, Blenheim Facility Management, and sponsoring entities harmless for any loss or accident to his/her horse, horses, employees or equipment which may occur from sickness, fire or other cause. ASSUMPTION OF RISK: By signing the entry blank, the Owner, Lessee, Trainer, Manager, Agent, Coach, Driver, Rider, Handler, Vaulter or Longeur acknowledges that horseback riding, particularly jumping, is a dangerous activity and involves inherent risks that may cause serious injury and in some cases death because of the unpredictable nature and irrational behavior of horses, regardless of their training and past performance and expressly assumes all such inherent risks whether identified herein, in the entry blank or in the Federation Rules and Regulations. A horse, without warning or any apparent cause, can buck, stumble, fall, rear, bite, kick, run, make unpredictable movements, spook, jump obstacles, step on a person’s foot, or push a person--all of which may cause the rider or observer to fall or be jolted, resulting in serious injury or death. A horse may also become loose and cause injury to an observer or rider or to another horse – a loose horse can run at full gallop in a panic and run into objects or persons or other horses. The Show Ground Facilities are bordered by highways/roads and thus noise from traffic and other sources occurs that can and will cause a horse to unexpectedly spook or react quickly. The Show Ground Facilities contain roads and driveways that are traversed by cars, golf carts, tractors, trailers and heavy equipment all of which may spook a horse. The above warnings and risks are meant as an example of some of the risks that are inherent and may be encountered but it is agreed this is not an exhaustive list and there are numerous additional conditions and/or events that may result in injuries while participating in the Competition and/or being present on the Show Ground Facilities. allowed inside the arena. See specifications in the horse show office & time schedules for more details. Sign up using the Official Entry Form – Class 700. 16. CLOSED RINGS: Show arenas are closed at all times when not being used for classes. Sand hunter arenas will be open the day prior to the start of the show and for a limited amount of time at the conclusion of the show day. VIOLATIONS of the above will be considered cause for FINES and/or ELIMINATION. 17. CONFLICTS: It is the intention of Horse Show Management to avoid holding rings to wait for horses and/or riders. Riders with conflicts must arrange their jumping order with the starters so that they will not hold up a class. Paddock Stewards have the authority to scratch riders who are not timely. Trainer conflicts are not considered legitimate conflicts. 18. MANURE: Manure must be placed in designated areas, kept separate from trash. Each violation will result in a $100 fine. 19. DOGS ARE A SERIOUS SAFETY AND HEALTH PROBLEM AT ALL HORSE SHOWS. USEF GR 1301 – Dogs are not permitted to be loose on competition grounds and must be on a leash or otherwise contained. Individuals must not lead dogs on a leash while mounted. Dog owners failing to comply with this rule may be subject to penalty under Chapters 6 and 7, as well as issuance of warning cards. 20. PARKING: All vehicles must be parked in designated parking areas. Unauthorized vehicles in non-designated parking areas or permit-only parking areas are subject to being towed away at owner’s expense. 21. MOTORIZED VEHICLES: Minors who do not have a valid driver’s license which allows them to operate a motorized vehicle in the state in which they reside will not be permitted to operate a motorized vehicle of any kind including, but not limited to, golf carts, motorcycles, scooters, or farm utility vehicles on the competition grounds of recognized competitions. Minors who have a valid temporary license may operate the above described motorized vehicles if they are accompanied by an adult with a valid driver’s license. The parent(s), legal guardians(s), or individual who signs the entry blank as parent or guardian of a minor operating a motorized vehicle in violation of this rule are solely responsible for any damages, claims, losses or actions resulting from this operation. Violations of this rule will be cause for sanctions against the parent(s), guardian(s), and/or trainer(s) who are responsible for the child committing the offense. Penalties may include exclusion of the child, parent(s), guardian(s), and/or trainer(s) from the competition grounds for the remainder of the competition and charges being filed against any of the above individuals in accordance with Chapter 6. Wheelchairs and other mobility assistance devices for individuals with disabilities are exempt from this rule. 22. MEDICAL WASTE: Sharps must be placed in proper receptacles; anyone found in violation will be fined $100/infraction. 23. DRUG TESTING: The Blenheim June Classic I, II, III, & Red, White, and Blue Horse Shows; AND Showpark Summer, Racing, and August Festival Horse Shows will be conducted under the auspices of the State of California Department of Food and Agriculture and USEF. 24. ARENAS: All warm-up and hunter competition arenas contain sand and/or grass footing. All jumper competition arenas are grass and/or sand footing. Warm-up arenas are approximately 150' x 200'. Sand arenas are approximately 130' x 290'. Grass arenas are approximately 250' x 300'. 25. CLASS SPECIFICATIONS: Every class offered herein which is covered by the rules and specifications of the current Federation Rule Book will be conducted and judged in accordance therewith. 26. MEASUREMENT CARDS: All ponies are required to possess a current USEF Measurement Card or valid measurement form issued by USEF and it must be shown at the horse show office before numbers are released. 27. COMBINING/SPLITTING OF CLASSES: IN ALL “A” RATED HUNTER SECTIONS – Should entries warrant, all “A” rated hunter sections will be split or combined following USEF rules and will be done so at the close of the horse show office on the evening preceding the first class is each section therefore entries MUST be completed for “A” rated hunter divisions accordingly to be considered. Any post-adds received and accepted after this time will not be considered in respect to the splitting/combining numbers. There will be no exceptions to this policy. Same day scratches and/or “no-shows” at the gate in all “A” rated hunter sections will forfeit their entry fee unless a Certificate from the Official Show Veterinarian vet scratch for the show is received by the official show secretary prior to the section in question. Should same day scratches or no-shows result in insufficient entries to keep sections split, sections will be combined. “Non-showing” fees will be assessed accordingly. When splitting all hunter classes, the preferred method will be “California Split” per HU 112. 28. STATEMENT OF HEALTH / VACCINATIONS: Per GR845 Equine Vaccination Rule: At Federation licensed competitions, horses entering the grounds must be accompanied by documentation of Equine Influenza Virus and Equine Herpes Virus (Rhinopneumonitis) vaccinations within six months prior to entering the stables. Horses not in compliance with this rule may be required to leave the competition grounds upon request by Competition Management. See accompanying Vaccination Certificate at www.Showpark.com/forms. 29. COURSES – HUNTER: To consist of at least eight fences with two changes of direction. Fences to simulate obstacles found in the hunting field. The area of the courtesy circle may be restricted by a mandatory line and will be indicated on the course diagram and designated by a physical barrier placed in the arena. Course diagrams will be posted at least one hour before the class. JUMPER: Time allowed calculated using 350 meters per minute unless otherwise indicated on course map (exception: 325 meters per minute for all Pony, Children’s, Adult Amateur competitions, or in very small or indoor arenas). See JP 131 for additional information; All Courses will be posted no later than 1 hour prior to the start of corresponding competition. 30. START ORDERS: Riders and trainers who have conflicts due to jumping positions commencing at the same time in multiple rings are required to consult the Paddock Steward or Technical Coordinator prior to the start time of the competition(s) in question so that necessary adjustments can be made in the jumping order to accommodate said conflicts. If a Management determined Posted Order is not implemented all jumping orders will be conducted using the Exhibitor Sign Up method which allows all entries properly entered the option to sign up for a competition time slot/jumping position via online from 6:00pm - 5:00am prior thru Showpark.com and the Blenheim App OR in person using the official signup sheets at the tent by the main food stand from 6:30am 7:30am prior. Entries failing to make their scheduled time slot/jumping position within one minute of their scheduled start time may be allowed to compete at the discretion of the Paddock Steward if a time slot becomes available and only if the entry competes prior to the proposed competition end time. Entries failing to sign up for time slot/start position will not be allowed to compete unless authorization is granted by the Technical Coordinator or Show Management. HUNTER: Competitions in the Hunter Rings will be assigned by Management a specific start and end time. Per HU 159, Management may institute a Posted Order to determine the Start Order for all hunter and hunter equitation jumping competitions; if such an order is implemented failure to enter the ring within one minute after an audible signal to proceed is given incurs elimination. JUMPER: Competitions in the Jumper Rings will be assigned by Management a specific start and end time; competitions held at the same height and listed together on the time schedule will be run concurrently. Per JP 112, Management will institute a Posted Order to determine the Start Order for all Grand Prix and competitions held in the Grand Prix Ring, all competitions $5000 or greater, plus the highest placing money class per section; Management may also institute a Posted Order to determine the Start Order for all other jumping competitions. Failure to enter the ring within one minute after an audible signal to proceed is given incurs elimination. 31. MICROCHIP VERIFICATION: All horses competing in classes that require USHJA horse registration must provide a microchip number that verifies their animalâ&#x20AC;&#x2122;s identity in order to compete for points, money won or be eligible for Federation and/or USHJA programs and awards where horses are required to be recorded or registered. A microchip used to verify identity must be a fifteen-digit ISO compliant 11784/11785 chip and be implanted in the nuchal ligament of the animal. All horses that are competing in classes which require USHJA registration which are not microchipped will be ineligible to compete in Federation licensed competitions, Exceptions: USHJA Outreach and those activities enumerated in GR901.9, items 1-9. 32. SAFE SPORT VERIFICATION: As of January 1, 2019 all USEF members 18-years-old and older, with a Competing Membership, must complete SafeSport Training in order to be eligible to participate in USEF activities, including competitions. Please see the USEF website at https://www.usef.org/compete/resources-forms/rulesregulations/safe-sport for more information. Those who do not complete the training will be ineligible to participate in USEF activities, including competitions. Join thousands of exhibitors and submit your horse show entries online through Equestrian Connect! Equestrian Connect is a web service where you store your data once, and use it to automatically fill out all your entry forms. In just a few clicks, you can submit your forms online to hundreds of horse shows across the country. Whether you are an amateur or professional, large barn or small, you will complete your entries in minutes. To learn more, visit our website. Equestrian Connect offers a free 45-day trial. BLENHEIM HORSE SHOWS – SAN JUAN CAPISTRANO FOR U.S. POSTAL SERVICE: 7668 El Camino Real, Suite 104–501, Carlsbad, CA 92009 FOR SHIPPING – UPS/FEDEX only: 30753 La Pata Rd, San Juan Capistrano, CA 92675 DIRECTIONS TO THE RANCHO MISSION VIEJO RIDING PARK: Take the San Diego Freeway I–5. Exit at Ortega Highway. Go East for 4 miles. Turn right onto La Pata Road, the facility entrance will be on your right-hand side. SHOWPARK HORSE SHOWS – DEL MAR FOR U.S. POSTAL SERVICE: 7668 El Camino Real, Suite 104–501, Carlsbad, CA 92009 FOR SHIPPING – UPS/FEDEX only: 14550 El Camino Real, Del Mar, CA 92014 DIRECTIONS TO THE DEL MAR HORSEPARK: Take the San Diego Freeway I–5. Exit at Via de la Valle. Go East for 2 miles. Turn right at the stoplight at El Camino Real. Take the second driveway on the right. Hollow Brook Wealth Management Show Jumping Hall of Fame Jumper Classic Series The Hollow Brook Wealth Management Show Jumping Hall of Fame Jumper Classic Series is designed to give amateur-owner and junior riders an opportunity to compete at higher levels and serves as a proving ground for many riders who aspire to someday represent the United States in international competition. With classes at approximately 100 horse shows across the country, the Series hosts separate junior and amateur-owner divisions in two Conferences East and West. Series standings are used to help determine junior and amatuer-owner entries for the National Horse Show and the Blenheim International Jumping Festival. Series winners receive year-end awards, and the Series offers Year-End championship Finals for junior and amateur-owner riders at the National Horse Show and the Blenheim International Jumping Festival. 2019 Blenheim Summer Series – Dates, Ratings, Officials, Prizes and Entry Blanks.